Manufacture J & S Cell Tray rack and Workstation to drawing number AD-145-2013-04-1. The framework will be assembled from 40mm x 40mm heavy duty extruded aluminium profile and fitted with 100mm diameter swivel and braked castors. 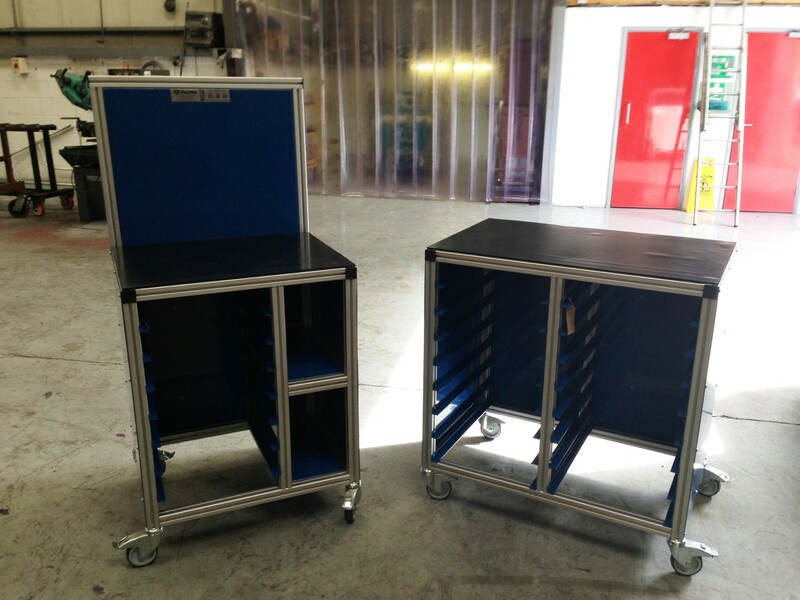 The interior framework of the Workstation will consist of a tray rack section and A4 folder compartments. The up stand back will feature a perforated tool board and be manufactured from mild steel and powder coated to give a hard wearing durable finish. The mild steel table top will be covered in 3mm black rubber. Approximate overall size 750 (W) x 610mm (D) x 1560 (H) (table top height is 960mm). The Tray rack will again be manufactured from 40mm x 40mm heavy duty extruded aluminium profile and fitted with 100mm diameter swivel and braked castors. The interior framework of the rack will consist of two tray rack sections with angle runners to support the trays. The mild steel table top will be covered in 3mm black rubber. Approximate overall size 850 (W) x 700mm (D) x 960 (H).